Lost, Then Found: Shipping Containers On Seafloor Scientists surveying the bottom of the Pacific Ocean have discovered something they knew was there but had never seen before: a shipping container. Thousands fall off cargo ships each year, and it's not yet known how the boxes, which carry everything from chemicals to ribbon, are affecting the ecosystem. 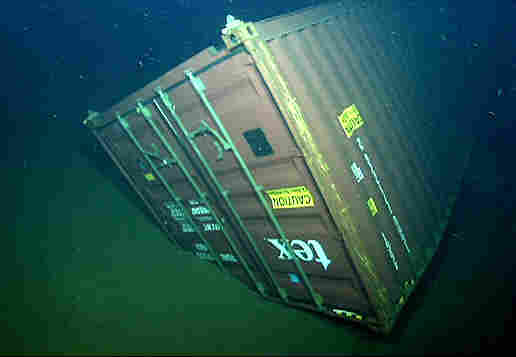 Scientists surveying the bottom of the Pacific Ocean have discovered something they knew was there but had never seen before: a shipping container. Cargo ships regularly lose these containers overboard — they write them off and collect insurance. But now marine biologists have found one off the coast of California and have decided to study how it may affect sea life. Already, they've discovered that the container has become a new type of habitat on the muddy ocean floor, attracting its own suite of creatures. That might not pose any problems, but the idea that tens or even hundreds of thousands of containers are down there might. The investigation started with real needle-in-a-haystack kind of luck. Biologists on a research ship in 2004 were scanning the seafloor in the Monterey Bay National Marine Sanctuary with a robotic submarine. It was mile after mile of mud until, suddenly, the navigator's screen filled with the image of a bright yellow shipping container. What nobody's really thought of before was the trash that we're leaving across the Pacific and other oceans every time we lose these containers. Andrew DeVogelaere, a biologist with the sanctuary, is one of the scientists studying it. "This is a 40-foot-long container, and it landed upside down with one corner stuck into the soft sand muddy bottom," he says. The scientists who first found it marked its location. Eventually, they tracked the container to the merchant vessel Med Taipei, which had lost 15 containers in a storm off Monterey Bay a few months earlier. The yellow container was one of those. 'Highways Of Trash' In The Oceans? The law says you can't dump stuff in a marine sanctuary. The sanctuary negotiated and the shipping company agreed to pay for a study of how the container might affect life at the sea bottom. But what could a single container really do to sea life? Well, DeVogelaere points out that it's not just one container. "As a matter or course of business, about 10,000 of these containers fall off of a ship every year," he says. That's a rough estimate — no one knows exactly what the number is, but it's clearly in the thousands every year. And they're clustered along shipping lanes that crisscross the oceans. "What nobody's really thought of before was the trash that we're leaving across the Pacific and other oceans every time we lose these containers, and to drop hard substratum along certain routes could create steppingstones or highways of trash as years accumulate and these things don't really disintegrate," DeVogelaere says. DeVogelaere recently returned to the site with a robotic submersible and a team from the Monterey Bay Aquarium Research Institute. Submerged now for seven years, the container still looks new, and it has attracted a lot of sea life, like Neptunea, a large sea snail with big shell. "What we think might be happening," DeVogelaere says, "is that they are attracted to this place to lay their eggs on it, but then there's octopus and large crabs underneath that feed on them, so you have a whole bunch of broken shells as well." These containers are creating a new kind of habitat, with its own bevy of creatures, in the middle of the seabed. DeVogelaere says no one can say yet if that's bad — the seabed is still a big mystery. But what happens if we "pave" parts of the seabed with containers? "Who knows?" he says. "They could even provide steppingstones for invasive species that go from one coastal harbor to another." And containers carry everything, from toxic chemicals to ribbon. The Monterey Bay container appears to be safe, though — according to the shipping company, it's full of radial tires. The audio and a previous Web version of this story incorrectly referred to Andrew DeVogelaere's first name as Peter.